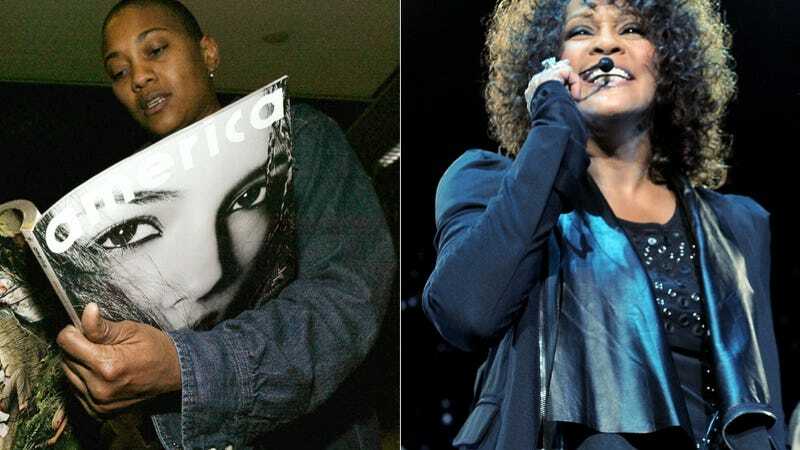 Lifetime's Whitney Houston biopic, Whitney, which premieres in January and might not be terrible, will cover the rumored romantic relationship between Houston and her best friend Robyn Crawford. Given how the network covered sexual predator R. Kelly in its Aaliyah biopic, it's no surprise that they're going there. Houston herself never confirmed the gay rumors, only telling Time in 1987: "People see Robyn with me, and they draw their own conclusions. Anyway, whose business is it if you're gay or like dogs? What others do shouldn't matter. Let people talk. It doesn't bother me because I know I'm not gay. I don't care." In a 2013 interview with Oprah, Houston's mother Cissy said she wouldn't have condoned Whitney being gay. After Houston's death, Esquire published a touching obit from Crawford, where she told them: "I have never spoken about her until now. And she knew I wouldn't. She was a loyal friend, and she knew I was never going to be disloyal to her. I was never going to betray her." But Crawford has actively avoided the media. So no one really knows what happened, but Lifetime would never pass up a storyline about a pop icon with a potential lesbian lover, so they cast actress Yolonda Ross in the BFF role alongside YaYa DaCosta as Houston for its biopic directed by Angela Bassett. I think it's always a fine line to walk when you're playing someone who's a real character. It's the same thing I did when I was in Antwone Fisher. That was a real person I was playing in that movie, too, and I wanted to know some things about that person, but not everything about that person so that you're not mimicking in that way. But in this case, there wasn't a lot out there about Robyn for me to even get into. It was, more or less, taking what's on the page and making that real—making what I feel this relationship is or would be real. I personally knew of fights that went on between Bobby and Robyn during that time. You would hear about them. And you also knew that Cissy didn't like him. That kind of stuff was out there, so it's keeping all that in mind but still playing what's in front of you in the script. You can't add to something that is not documented, not written in. No, I wasn't shying away from it. She's a beautiful woman. And from what I knew of Robyn then, I don't think she was in the closet. It's a love and it's an admiration. So that was played there. How much of it is a love that's between two lovers is a different story, because that, then, would have called for there to be different kinds of scenes in the movie. I played it as love and longing. Ultimately, what's happening with them is that the person who Robyn loves is leaving. No matter if you're lovers or a best friend, when someone you love leaves to get married, your relationship is going to change. That's what I played. And that's what it was. We'll see how it plays out when the biopic airs on Jan. 17. Ross assures that "a lot of care was taken with it, with the story and the performances. I don't think it's anything that people will down upon. We were really respectful in everything that I did."